Of all the second half games the Giants have played, Saturday’s might have been the one in which you least expected a victory. Matt Cain entered with a 5.53 ERA and just one recent start he could feel good about. Stephen Strasburg came in with a 15-1 record. But there was Cain, taking a shutout into the sixth and holding every inch of a big lead the Giants built off Strasburg. The longest-tenured Giant earned his second "W" over the Nationals in a week in a 7-1 victory that was as clean a game as the Giants have played since the All-Star break. 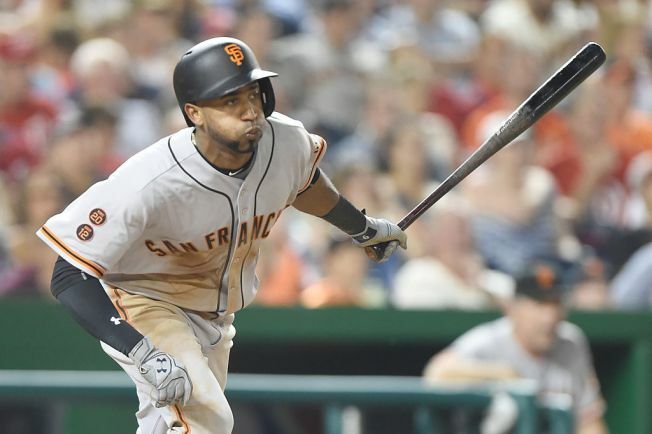 Eduardo Nuñez took care of most of the offense with two triples, a double, a single and three runs, and Brandon Belt added a homer and two doubles. It was never particularly easy for Cain, but when he had to, he made big pitches with two on and two down in the second, Cain got Ben Revere to ground out softly to third. With a runner on third the next inning, he threw Bryce Harper a series of 92 mph fastballs and then finished him off with a wicked slider. Cain loaded the bases in the fourth, but Revere hit a one-out roller to first and Belt alertly threw home for the force. A strikeout of Stephen Strasburg ended the inning. Strasburg struck out five the first time through the order, but Nuñez smashed a ball off the wall while leading off the fourth and sped into third. Buster Posey’s single gave the Giants an early lead and a bases-loaded walk of Joe Panik made it 2-0. Nuñez hit another triple in his third at-bat and scored when Belt’s bloop to left dropped just in front of Jayson Werth. A sac fly from Brandon Crawford stretched the lead to four. Strasburg had his shortest start of the season (4 2/3 innings) and was charged with at least four runs for just the fifth time in 21 starts. Starting pitching report: Cain has turned it on in his past two starts, both coming against these first-place Nationals. In 10 scoreless innings, he has allowed just five hits. Bullpen report: Hunter Strickland’s last 20 innings: 4 runs, 13 hits. At the plate: The last five Giants with a two-triple game: Nuñez, Gregor Blanco, Fred Lewis … and Belt and Brett Pill. It's an odd list. This was the first career two-triple game for Nuñez, who singled in his fourth at-bat. The nine total bases marked a career-high. In the field: Crawford got way up to rob Trea Turner of a leadoff single in the fifth. Attendance: The Nationals announced a crowd of 36,404 human beings who missed some quality swimming. Up next: Madison Bumgarner will try to clinch the first series win of the second half (seriously, that’s true). He’ll face Tanner Roark.